I love an accidental discovery. A gloomy Sunday at the beach made for a good time to drive to Wilmington. As we drove in on Oleander, a man dressed as a hot dog caught my attention. I made a note to return and investigate. An hour or so later, we headed back, keeping alert for a hot dog man. Sadly he was gone. Or maybe we missed him. On the final pass, we saw the big hot dog sign and a sign for Sam's Hot Dog Stand just behind it. It looked quiet and deserted. Afraid they were closed for the day, we investigated a little further and found they were open for a couple more hours. Let's do this! 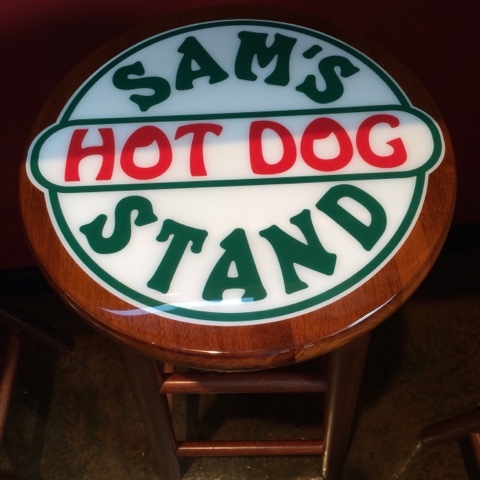 Inside, an open kitchen looked out upon a handful of tables and numerous stools with the Sam's Hot Dog Stand logo encased in shiny varnish. 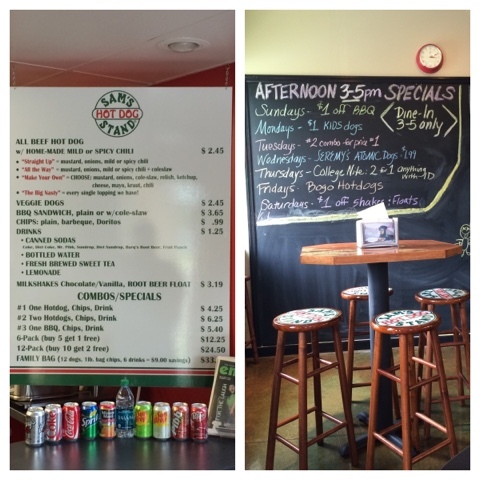 Near the register, a menu board detailed their offerings: hot dogs and BBQ sandwiches in various combinations. The menu board was surrounded by various cans of soft drink, including Sun-Drop and diet Sun-Drop. Score! A chalkboard on another wall detailed their daily deals. 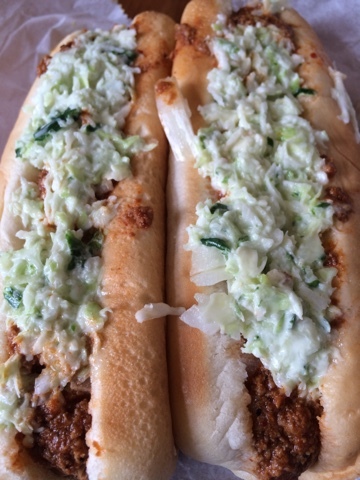 After inquiring about their slaw, I ordered two with the signature Carolina Hot Dog toppings: mustard, slaw, chili, and onions--or as they call them, "All the Way," including their spicy chili. 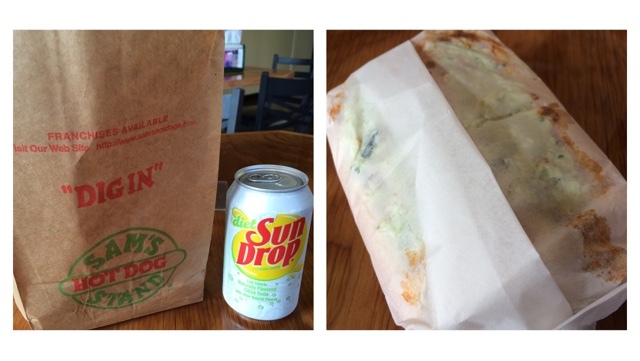 The two dogs arrived nicely packaged in a Sam's Hot Dog Stand paper bag, along with my chips and diet Sun-Drop. They looked great and tasted better. The slaw is clearly fresh and made on-site, a perfect blend of cabbage, mayo, and seasoning. The spicy chili added just a bit of kick. It was meaty and savory. Not sweet like so many lesser hot dog chilis, this was near perfect. The mustard, onion, hot dog, and bun each played their part to support the starring chili and slaw. Truly a great Carolina dog. Before I left, I also sampled the mild chili and the BBQ. The mild chili was almost as good as the spicy--but without that little extra something. The BBQ, imported from Siler City, was smoky and delicious. What a great find. 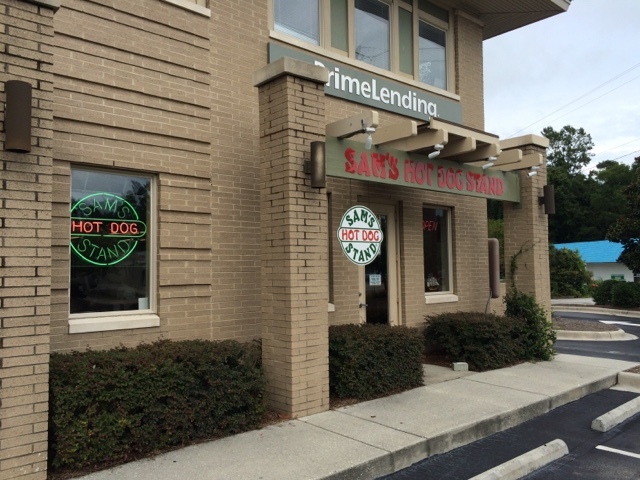 I loved Sam's Hot Dog Stand. It is now my favorite hot dog in Wilmington, easily the best southeast of Raleigh, maybe further.